The Nuggets and the Nets have both started off the season relatively slow, but may be on the cusp of getting into a grove when they meet Tuesday night in Brooklyn. Denver has torn it up the past two weeks and is riding a season-high seven game win streak after beating the Raptors 112-98 at Toronto on Sunday. The Nuggets have moved the ball around better than most this season, and had five players hit double-digits in scoring in Sunday’s win while improving their record to 10-6 on the season. The Nets return home after winning 97-88 at Memphis on Saturday. Brooklyn has started off the year slow under new head coach Jason Kidd, but have been hampered by a number of injuries. 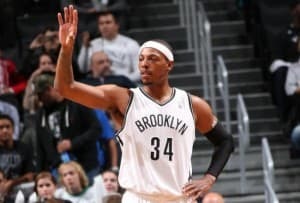 Paul Pierce is out with a broken right hand for 2-4 weeks; along with All-Star point guard Deron Williams, shooting guard Jason Terry and Andrew Kirilenko. Center Brook Lopez finally returned from an ankle injury in the win against Memphis on Saturday and made an immediate impact. He scored 20 points and was a presence on the glass. It has been a rough start to the year for the Nets, but even though they have still clearly not turned things around entirely – they are at least in ballgames in the final minutes. The win against Memphis was huge and as they begin to get healthier and one has to this team becomes a contender for a playoff spot by mid-season once they get over their injury woes. Their confidence is riding high after Sunday’s win, and I think they steal one at home against the red-hot Denver Nuggets. I see a lot of value in the +4.5 home-dog Nets. The Heat welcome the Pistons to the American Airlines Arena in the midst of an 11-game winning streak. Miami notched their last victory Sunday over the Charlotte Bobcats 99-98 to put their record at 14-3 – good for second best in the Eastern Conference – behind the Indiana Pacers. With the Heat, it always comes back to reigning MVP LeBron James. James continues to dominate each night and leads all forwards in field goal percentage with 64.8. Miami, as a team, leads the NBA in field goal percentage at 59.8 percent. The Heat will have to contend with a young athletic frontcourt of the Pistons, led lately by center Andre Drummond. Drummond had one of his best games of his short career in Detroit’s 115-100 win on Saturday’s 115-100 win against the 76ers. He scored 31 points, grabbed 19 boards and stole the ball six times. At 7-10, Detroit will need a massive game from both Drummond and his supporting cast to knock off powerhouse Miami. One area Detroit may have an edge is in the rebounding category. They have a plus 6.1 rebound differential within the last week which is tops in the Eastern Conference. I am not in love with either side in this one, but I think this game will be a lot more defensive than most think. The Heat play excellent defense and have allowed 100 points or more only once this season. Detroit can score the rock, but are slow to get into their offense. I would probably cap this total at about 195. I could see the Heat keeping the Pistons under 90 points easily. The Raptors head to Golden State in a game that both teams desperately need to get back to their winning ways in each conference. The Warriors had lost six out of their last six games before winning 115-113 at Sacramento on Sunday. Golden State has been losing as of late but have been in most contests until the final seconds. They lost their two previous games by a combined just five points. The Raptors are coming into this contest in the midst of a three-game slide where they have averaged just less than 94 points per contest. Toronto lost 112-98 in a loss to Denver on Sunday, after leading by 15 points in the first half. The Raptors have been poor defensively as well, which does not bode well for them in a matchup against the Warriors. They are 10th in the league in scoring with 102.9 points per game. In addition to lack of defense, both of these teams turn the ball the ball over constantly. Their recent poor play has been mired with turnovers and poor defense, and I doubt that changes tonight. I think this game is tonight’s 120-110 type of affair and I recommend both the Warriors -7.5 and the over in this one. The Raptors simply will not be able to keep pace with them, but will try to run-and-gun anyway.